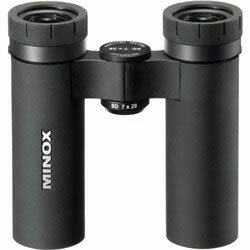 Numerous international awards confirm the high quality of the MINOX compact binoculars again and again. By developing further innovative features the design engineers at MINOX have now been able to provide even greater performance. A distinguishing feature of this new generation of binoculars is the completely new eyepiece designed for people wearing glasses. The eye relief has been increased over 30%. This means that people wearing glasses can now enjoy a full field of view. There is also no more awkward turning over of rubber eyecups. The new compact binoculars have revolving eyecups that can even be adjusted in half stops. As soon as you pick up one of the new design models you will notice its true quality features. The sturdy ABS body and the additional rubber armoring provide durability in the optical systems, even when the going gets tough. Further distinguishing features are the intricate lens systems with their multicoated roof prisms which provide excellent contrast and extremely high resolving power, even under critical light conditions. The ergonomic design makes these binoculars extremely handy to use and permits shake-free viewing of nature scenes, sports events, opera and theatre. Geom. twilight number Operating temperature Waterproof Height x Width x Depth Weight, approx. Some opportunities and moments offer themselves only once in a lifetime - breathtaking landscapes with their immense richness of wonders or even impressive architecture with its fascinating details - all longing to be discovered. With the new and rugged BD 7x28 IF compact binoculars from MINOX, adventurers and discoverers alike can enjoy these moments with all senses and not miss a thing, regardless if on a demanding hike in the mountains, on an eventful sailing tour around the globe or even on discovery tours in the cities around the world. The high quality leading-edge optics of hightech optical glass, multi layered coatings and the 7x magnification is perfectly protected by an extremely robust light metal housing against raw weather conditions on land or on water. The path-breaking novelty is inno­vative ergonomics: Thanks to the well-conceived ergonomic design with an open comfort bridge and anti-slip rubber armouring, the 12 oz tough and compact binoculars offer an extremely secure and effortless handling. With its brilliant precision optics, the BD 7x28 IF is a constant companion providing razor-sharp views of everything, anywhere, and that from 20 metres to infinity. These handy compact binoculars offer a high-contrast image, brilliant colours, and a bright clear image experience in every situation, whether at high seas or on an eventful hiking tour. For unlimited mobility and untarnished, brea­thtaking experiences of nature. The BD 7x28 IF is water-proof down to 5 Metres and its high pre­cision interior is optimally protected against corrosion and fogging by a high quality nitrogen gas filling offering a typically proven and long-lasting MINOX quality at an unrivalled cost-performance ratio. A 30 year guarantee underlines the high demand of quality expected from MINOX products. A dioptre scale and twisting eyecups with a snap-in setting make these elegant compact binoculars the ideal companion for eyeglass wearers, which include a neoprene strap and carrying case. 14 14° up to 122° F / -10° up to +50° C yes, down to 16.40 ft / 5.0 m 4.4 x 4.2 x 1.4 "